Ola Rosling and Anna Rosling Rönnlund are the son and daughter-in-law of Hans Rosling. The three of them co-founded the Gapminder Foundation: a nonprofit that fights devastating misconceptions about global development, produces free teaching resources making the world understandable based on reliable statistics, promotes a fact-based worldview everyone can understand, and collaborates with universities, UN, public agencies and non-governmental organizations. The Factfulness project was born to help people get a fact-based worldview. Since the world is better than most people think, a fact-based worldview actually reduces stress and anxiety. Using Factfulness, readers and listeners can dismantle the misconceptions that shape today’s overdramatic worldview. In his work as a medical doctor, professor of international health and renowned public educator, Hans Rosling discovered monumental ignorance among even the most educated people about the state of the world. He was an adviser to the World Health Organization and UNICEF, and co-founded Médecins sans Frontières in Sweden. His TED talks have been viewed more than 35 million times, and he was listed as one of Time Magazine’s 100 most influential people in the world. Hans died in 2017, having devoted the last years of his life to writing Factfulness.Now, Ola and Anna devote their lives to continuing the mission of Gapminder. Ola Rosling served as its director from 2005 to 2007 and from 2010 to the present day. After Google acquired the bubble-chart tool called Trendalyzer, invented and designed by Anna and Ola, Ola became head of Google’s Public Data Team and Anna the team’s senior user experience (UX) designer. They have both received international awards for their work. 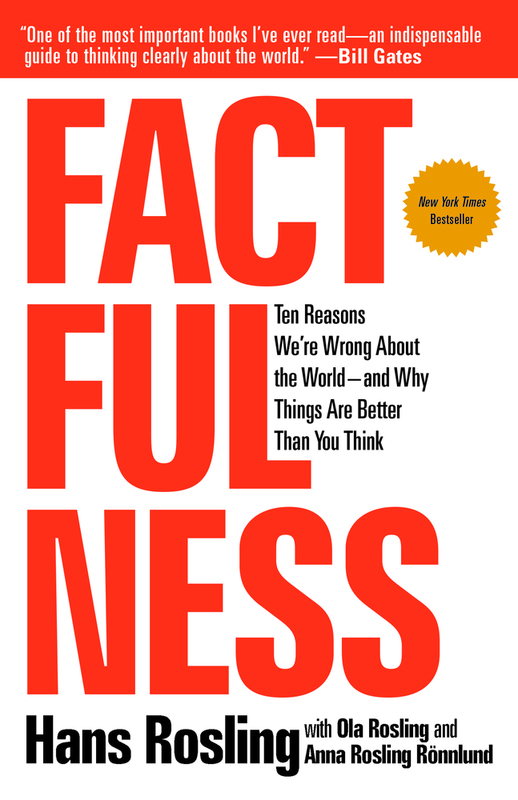 Factfulness Anna and Ola offer a radical new explanation of why we get the answers wrong to life's basic questions. They reveal the ten instincts that distort our perspective—from our tendency to divide the world into two camps (usually some version of us and them) to the way we consume media (where fear rules) to how we perceive progress (believing that most things are getting worse). "...a hopeful book about the potential for human progress when we work off facts rather than our inherent biases."